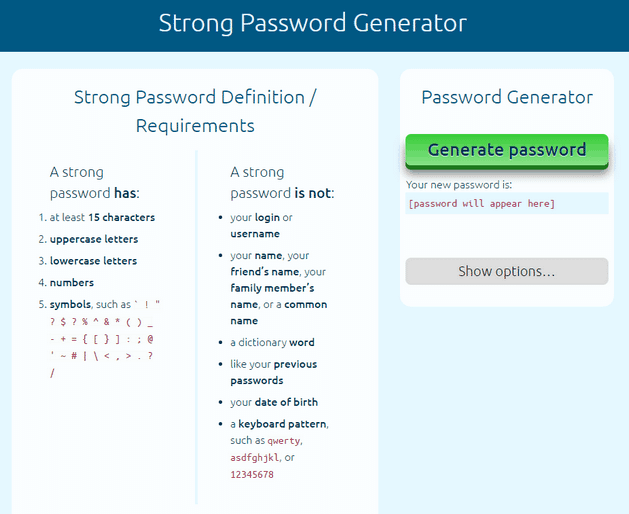 Get help creating a strong password using a password generator tool. Strong passwords are key for protecting your personal information and assets online. You should use a different password for each login you access. What’s more important is that you need strong passwords. Your date of birth, hobby, name or common English words are useless when hackers want to steal your life. In today’s modern technological age, everybody has various devices such as desktop computers, laptops, tablets, iPads and smart phone. Because nobody wants their personal information stolen, this means people need passwords to protect everything they use. This doesn’t merely mean protecting the device itself from being hacked. It also means preventing hackers getting your information from websites. Social medial sites such as Facebook, LinkedIn, Twitter and many others are used daily by millions of people all around the world. Some people use the same password for them all. Online banking, running websites, using emails and many other things all need protection from prying eyes and so you need passwords for them all. Using strong passwords can help shield against traditional password attacks such as dictionary, rainbow tables, or brute-force attacks. You need strong passwords so these strong password generator tools will help keep you safe from being attacked online. Norton (by Symantec) offers a useful and free password generator. You have the usual options of choosing numbers, letters, symbols to be included or excluded and you can generate 50 passwords with a single click of the mouse using Norton’s password generator tool. They also offer software you can download and you can save your passwords for future reference in their special identity safe program. This is handy if you want to be able to access your passwords from anywhere. However, even though they’re reputable and claim it’s safe and secure, you’re still storing your passwords online, so it may require more thought. This tool lets you create strong passwords in your browser without ever sending it across the Internet. It’s easy to use and you automatically get a long, complex and randomly created password. A good feature this tool offers is the avoid similar characters e.g. ( 1, i, I, l, L), and (0, o, O). This simple tool means you never have to reuse the same password anywhere more than once and you can easily generate strong passwords for all of your accounts online. By its very name, you can already tell that this is a strong password generator. You can choose any length password and any combination of upper and lowercase letters, symbols, numbers and length. However, you can only generate one password at a time. One extra feature this site has is that you can export your password to your smartphone or tablet. It never travels via the internet so this method is safe and secure but it means you can store passwords on your other device for future access if that’s something you want to do. You can also get as many different passwords as you want with one click. This is handy because you’ll probably need 10 or more passwords. Once you have generated the passwords, write them down somewhere safe for future reference. Do not keep a copy on your computer because that’s one of the first thing hackers look for if they get into your computer. You can create your password easily with this generator. Apart from the usual numbers and/or letters, you can use the HEX option which uses 0-9 and/or A-F. You may choose the “easy to remember” option and it will use one or two words and a few numbers in between. Finally, once you generate your password, it will tell you how strong the password is. It may only be “fair” or it could be “very strong.” Obviously the stronger it is, the more secure it will be but if you have memory issues, that may not help you. The Password Ninja works efficiently. You don’t get options to choose from. You just click the button and 10 passwords are generated. They all start with a capital letter and end in two digits. This means they’ll most likely meet the criteria for any site that needs a password. XKPasswd is secure and memorable password generator that is powered by the XKPasswd.pm Perl Module. The tool offers a range of settings to create strong passwords and uses entropy as a measure of password strength. 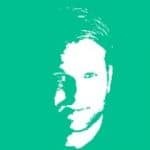 This is a simple generator that creates a single password for each search. 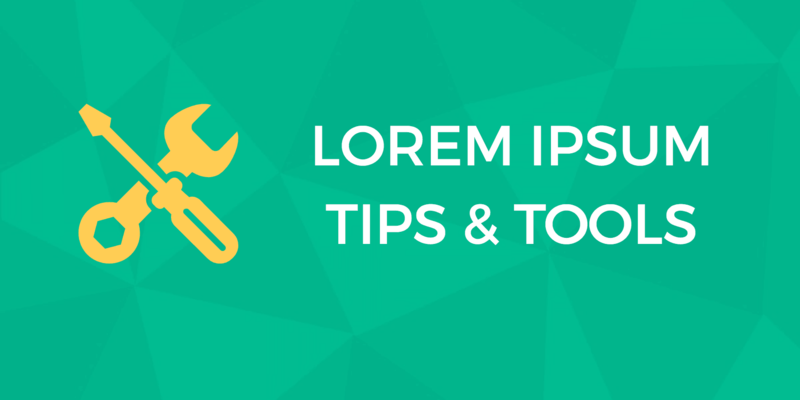 You can include or exclude the usual options of numbers, symbols and upper/lower case letters but it also gives you an extra option of inserting spaces. You can choose a password with five or more characters, even offering ones with 100+ characters which would be impractical. Password Bird is an unusual password generator because it generates differently to any others. You have three fields to enter information. The first one asks for a NAME that’s special to you. The second one asks for a WORD that’s special to you and the final one asks for a DATE that’s special to you. Then click to generate a password and it will be a blend of your three answers. You can click that button as many times as you like and it will provide you with a different password every time. This site is handy if you want something that you can remember but that isn’t “relevant” to anything in your life that somebody else might guess. Tech Zoom can help you generate passwords with the usual options of upper and lower case letters, numbers and symbols. However, it can also format your choices like a credit card number. This can be handy to keep in your wallet or purse because it obviously has no connection with your actual credit cards so will be meaningless to others. You can use all numbers if you wish or any combination but it will still resemble a credit card format. Obviously you would have to use 14 or 16 characters or it won’t appear to be a credit card number (if you use all numbers). Do you hate trying to work out what characters you want in a password? If so, this is the site for you. You only have to make two choices. Do you want to use symbols? How many characters do you want in your password? Once you have selected these options, hit the button and, voila, three brand new passwords will appear. If you don’t like any of those, keep hitting the button until you find something you do like. For truly random passwords, you can’t go past Random Password Generator. The only questions it will ask you are: how many characters do you want (from 6-24) and how many passwords do you want generated? It won’t use characters that look similar to each other. E.g. I and 1. Then you hit the search button and up to 100 passwords will be generated for you in that one click. The different option is that you can add or remove anything you don’t want used. Perhaps you don’t want your initials or even the letters in your name used. Simply put them in the remove box and they won’t be included in your password. 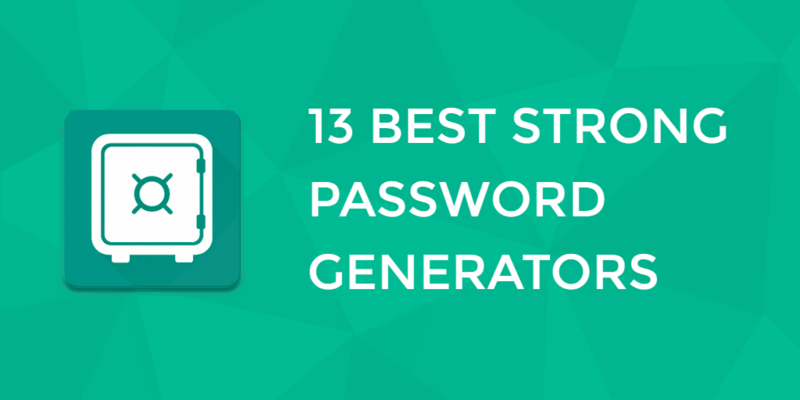 We couldn’t finish this list without a shameless plug for our own strong password generator tool. This tool let’s you create a secure password and let’s you use a combination of uppercase letters, lowercase letters and numbers and symbols. Passwords are a vital part of everyday life. You may want to have some input into how your passwords are chosen or you may like them to be generated with very little effort on your part. Whichever the case, the results will be the same; better passwords than you would normally come up with, and at a faster speed. You may decide to use a password manager to store all your passwords. This saves you time and energy when trying to log into sites you use, regardless of whether it’s frequently or rarely. You have to input all passwords and the sites they relate to into your password manager. Then you need to select a master password that’s used to access your password manager file. When you want to log into, Facebook, for example, you enter your username in Facebook and then use your master password in your manager and it will automatically populate the password field in your Facebook account. It’s as easy as that. There are lots of free and paid password managers available so do your research and find the one that best serves your needs. This list of secure password generators is far from complete but they cover most of the variables available for free. There are loads of others and they offer different variations to help you choose the passwords you need. It’s critical to protect yourself from brute force attempts, scammers and hackers by ensuring everything you log into online has its own password and that you never use the same password for more than one site. Don’t be lazy and choose easy passwords because the risks are simply not worth it.